Campus Kids enjoy learning Yoga. This fall, the students enrolled in the Campus Kids program have been enjoying the nice weather and doing lots of fun activities. Campus Kids is the Before and After school program located in Cedar Trails Elementary School. 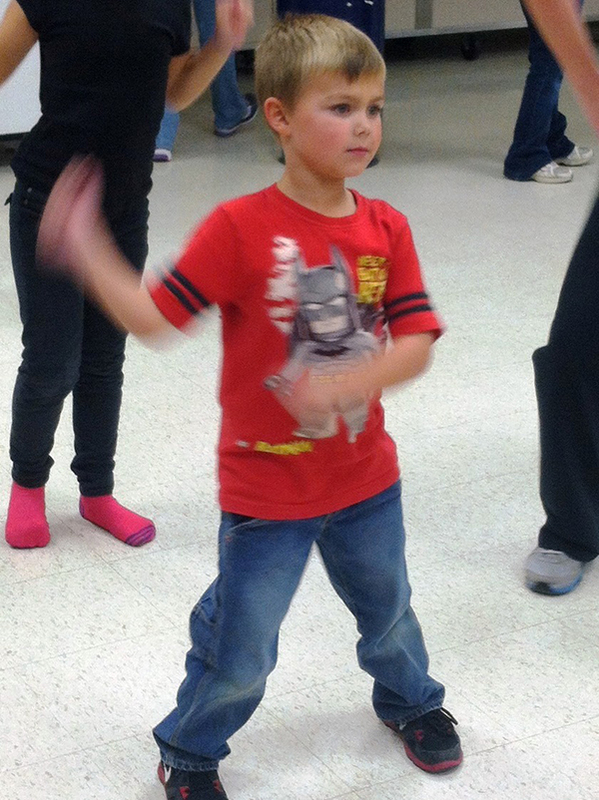 We have expanded our morning programming to include Arts and Crafts, gym time, group games, and Just Dance videos. The children are enjoying the morning structure, and look forward to what each morning will bring! 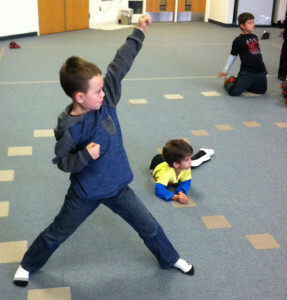 Campus Kids has enjoyed learning how to do Yoga in the afternoons. Michelle, from Moxie Fitness, has been coming on Thursdays to teach a Beginner Class. All of the students were given the opportunity to try the exercise, and a number of them signed up to continue on in a more advanced class. The students are learning poses to help with flexibility, strength, concentration, posture, and breathing. It is our goal to continue to expose our students to a large variety of new activities. Zumba is a favorite activity for many of our students, and that is offered once a month on Early Release Fridays. 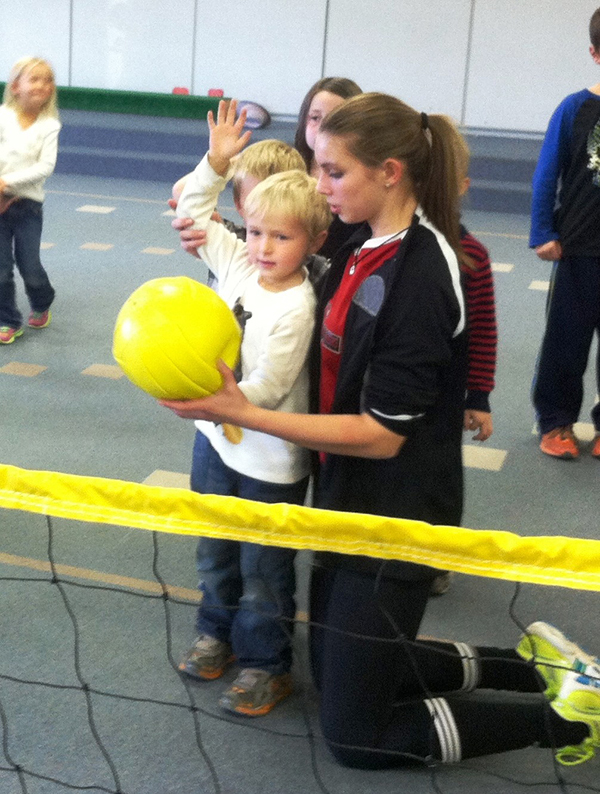 Campus Kids enjoy learning how to serve, set, and spike the ball from the Girl’s Varsity Volleyball Team. We have also received a visit from the Girl’s Varsity Volleyball Team this fall! 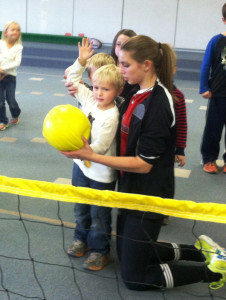 The team came over and showed everyone how to serve, set, and spike the ball. It was a very fun filled afternoon for everyone. Campus Kids is looking forward to winter and doing many winter activities and craft projects, while also learning about various customs around the world. For additional information about Campus Kids, please call us at 616 696-1716. The Davis Phinney Foundation, in partnership with Michigan State University College of Human Medicine, Van Andel Institute, Michigan Parkinson’s Foundation, Parkinson’s Association of West Michigan, and Saint Mary’s Health Care/Trinity Health West Michigan, invites people affected by Parkinson’s disease to share in an exciting day of information and inspiration by attending the Grand Rapids Victory Summit.™ Featuring both local and national Parkinson’s disease experts, the Victory Summit will share the latest research advances and treatment options as well as offer interactive sessions on exercise, speech therapy, yoga and other activities to incorporate into daily living. The Victory Summit will be held on Saturday, August 20, from 9:00 a.m. to 3:30 p.m. at DeVos Place, 303 Monroe Ave. NW, in Grand Rapids. The Victory Summit is open to people with Parkinson’s and their loved ones, and there is no charge to attend the event. For more information and to register for the Victory Summit, visit www.davisphinneyfoundation.org or call 1-877-208-1198. The Davis Phinney Foundation and the Parkinson’s disease research team at Michigan State University College of Human Medicine are proud to partner with the Grand Cycling Challenge and give riders of all ages and abilities the opportunity to help people with Parkinson’s while enjoying this inaugural extended course through downtown Grand Rapids. As a member of the Victory Crew™ on August 20, you can raise funds to support the Parkinson’s disease research team at Michigan State University College of Human Medicine and the Davis Phinney Foundation, sponsoring programs that provide the information, tools and inspiration that can be used to live well with Parkinson’s today. To participate, you must first officially register www.active.com/cycling/grand-rapids-mi/grand-cycling-challenge-2011?int=29-39 for the Grand Cycling Challenge. Be sure you have registered on the Active.com Registration page <before creating your personal fundraising page. For more information please visit www.davisphinneyfoundation.org or call 303-733-3340. Are you making a New Year’s resolution to get fit and healthy in 2011? Then Cedar Springs Area Parks and Recreation can help! They are kicking off their new winter schedule with a free demonstration night on January 4 at 6:30 p.m., and with programs for all fitness levels beginning January 10. On the free demo night you can try out some of the hottest trends in fitness—kickboxing, body bootcamp, yoga and Zumba! Kickboxing helps you punch away trouble areas as you burn calories with short but high intensity drills; body bootcamp combines the kickboxing with sculpting and abdominal exercises and is suitable for all fitness levels; yoga helps build flexibility and reduce stress; and Zumba helps you get a workout while dancing. You can also see a demonstration of two new programs on January 4—intro to ballroom dancing and cake decorating basics. People who sign up for ballroom dancing will learn the Foxtrot, the East Coast Swing, and the Rumba. No partner is necessary. With cake decorating participants will learn how to create icing flowers, ribbon roses, rosettes, and more. Other classes being offered this winter session include Tae Kwon Do, Men’s open basketball, and co-ed open volleyball. Youth volleyball begins Feb. 2, and a 12-week program called “Springs runs the river” will start Feb. 9 to get everyone ready to participate in the Fifth Third River Bank run later in the spring. For more information on what’s being offered and to download a registration form, visit www.csaparksandrec.com or call 696-7320.